Rathcroghan is a hidden gem, one of the most underrated tourist attractions in Ireland. An aerial view of the area from a photograph at the visitor centre. It is easy to distinguish and appreciate the individual sites from the air. This is a landscape full of ancient archaeological features covering 100 square kilometres around the small midlands village of Tulsk. The site is first mentioned in the early Christian Annals of Ulster of the seventh century which recorded the tale of the Táin, assumed to be a written record of oral pagan mythological tradition. Misgaun Medb is the name of this giant rock which used to stand upright in its day and may well have been one of the first monuments here erected during neolithic times. Rathcroghan is located along the Westport to Dublin road (N5) on the Westport side of the small villae of Tulsk. Public transport is scarce in these parts. You will have to travel by car. Main entrance of the Owennagat cave. Will you dare to enter? 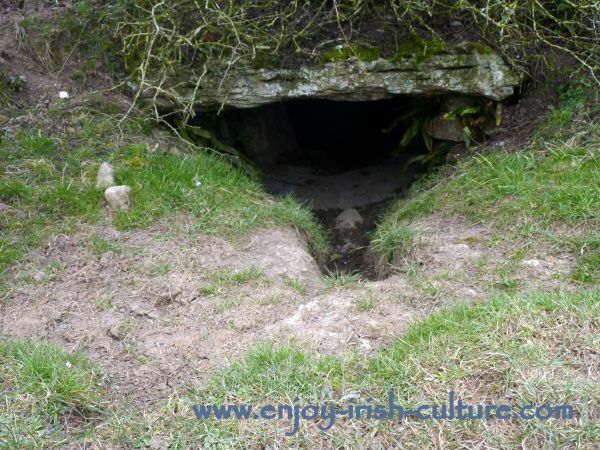 A man made souterrain incorporating two Ogham inscripted stones (believed to have been standing stones originally) leads into a 130m long cave, a lime stone fissure. The cave may have been used for ritual purposes. Exploration of the monuments is by walking. The most accessible monuments are located just off the N5 (Dublin to Westport road), on the Westport side of the small village of Tulsk. The village is home to a visitor centre ‘Cruachain Ai’ (free and open all year Mon to Sat) which has big signs outside. You can’t miss it driving through. Their friendly and helpful staff as well as the lovingly assembled exhibition and audio visual show will help to pull the exploration together. They have a nice cafe, too, which helps break the trip, and a small well priced gift shop. On a small budget, the centre aims to help make the monuments accessible to the public. They also organise conferences and public talks. 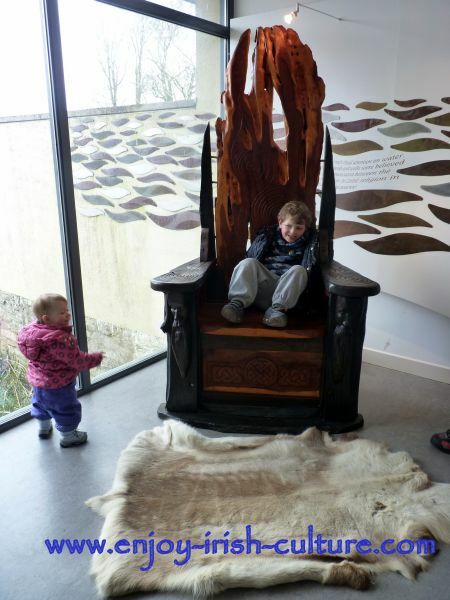 Cillian and Tara at the visitor centre having fun with one of the exhibits, a giant wooden throne, lovingly crafted from bog wood. An artists fantasy of what may have been. So, DO visit the Cruachain Ai centre and pick up a leaflet there with a map of the monuments before setting out on your tour. This will help you find the monuments and to appreciate what you are looking at. 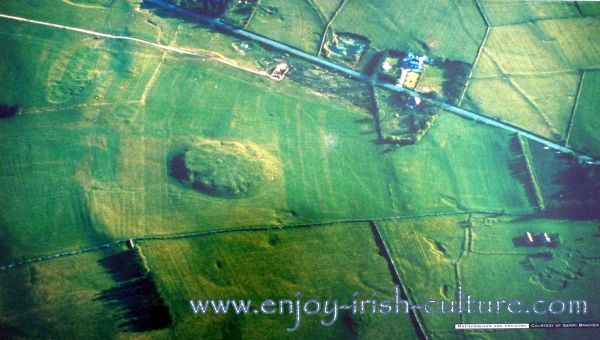 Not a bad idea seeing that all that is left of the ancient culture of the place are some earthen mounds, large rocks, ring forts, and a rather mysterious large cave with an Ogham inscription. (BTW, the visitor centre don’t recommend for people to enter the cave without a guide, but apparently many do. If you choose to, you will need proper equipment, such as torches and waterproofs.) Visits to all the monuments are free. Please respect them. Don’t leave any litter, and if you happen to find anything that might be of archaeological significance, alert the visitor centre. Rathcroghan Mound, also called The Great Mound. Two procession routes lead East and West from here marking it as a place of ritual. On good days you can see as far as Croagh Patrick in Westport from the top of the mound. Read more here about the history and significance of Rathcroghan as well as about the individual monuments. Find out about neolithic Ireland part one and part two. 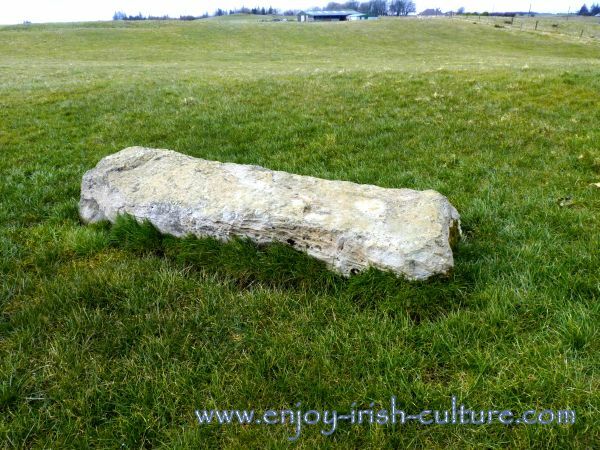 Find out about Newgrange, facts and features. Find out about the ancient Celts' living spaces and their cattle herding culture. The large area covered by these monuments and the fact that most are on private land and inaccessible to the public, would make me believe that there should be a small market at least for tours of the area from the air, but as yet there are none although the Cruachan Ai visitors centre draws about 10, 000 visitors a year, with many more people just exploring the sites and never visiting the centre. Alternatively, a guided tour would seem desireable. These have to be arranged and booked in advance by contacting the visitor centre. "Just note that guided tours in and from Rathcroghan Visitor Centre, professional and fully insured can be booked at a charge and all money raised go straight back to support, conserve, and educate about this wonderful Royal Complex which has been nominated for World Heritage Status in 2010." How to DO Rathcroghan? Break your car journey here some day. Plan a couple of hours for the visit. Start at the visitor centre taking in their exhibition. Set out from there to visit the most accessible individual monuments. Two are located right behind this building and can be accessed by walking, the rest will require a 4km drive. If you have the whole day to spend in the area, combine your visit of the Royal site with a visit to Strokestown House, a stately home not to be missed! We hope you enjoyed this page on one of the most underrated tourist attractions in the West of Ireland. If you like what we do on this website, please support us with a social shout out. You can use the easy social options we provide at the top left and at the bottom. Just choose the one you like!